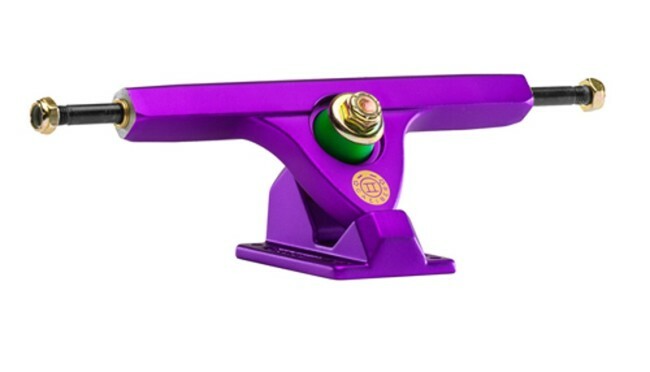 Caliber introduces an improved version of the Caliber Fifty 10 trucks. Features like a nice and linear lean and great durability stay, but the Caliber II sports some new features that level up this already great truck: The bushing seat got new steps to be more responsive and offers more rebound. The pivot cup comes with tighter tolerances for improved precision. The circular kingpin hole got the same measurements as the Precision Caliber for consistent and uniform lean. With an in-house heat treatment the axles are now 40% stronger than before and the pressed-in kingpin avoids any slop. The Caliber II 50° 184mm Truck is definitely a cast truck with the characteristics of a Precision! As usual the 44° version offers an a little more stable ride than the 50° trucks by still keeping their positive characteristics. The 50° trucks turn more agile with a little less lean.